﻿Our A.M.Q.M. 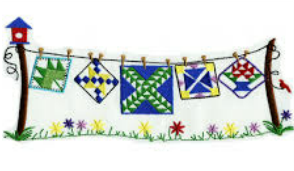 group is comprised of quilters who meet at the Bradley Public Library at 9:30 AM on the third Friday of each month. A Quiltmaker member may volunteer to teach a quilt related technique at our meetings and interested people can participate in that project or bring a project of their choice to work on. At the February meeting, Norma issued a challenge to guild members to work on their UFO's this year. This is a challenge where you don't have to b﻿uy anything﻿, just finish those lingering projects. Here is what you need to do for the March meeting. Bring a list of 10 projects that you want to finish this year. It could be finishing a binding, completing a number of complex blocks for a quilt, get a quilt or wall hanging finished, etc. Make sure that your list includes your name and contact information and give it to Norma. When you bring one of your UFO items to a meeting, you will get a chance for the prize that will be drawn next January. Only Norma knows what the prize is and promises it will be a good one. If you can't make it to the meeting, you can send your list by email to kankakeequiltmakers@gmail.com and we will forward it to Norma.